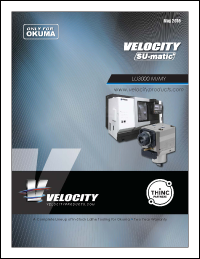 Velocity Products has the largest inventory of tooling Only for Okuma in North America. Velocity/SU-matic tooling is designed and manufactured by SU-matic – a worldwide leader in tooling technology headquartered in Switzerland. All Velocity SU-matic live tools are greased for life, run-in at the factory, pressure tested, CMM inspected, and serialized inspection reports kept on file. Velocity SU-matic Tooling for Okuma uses oversize output bearings, and Klingelnberg spiral bevel gears are machined in matched sets, then lapped in matched sets. • STP & STL files are available online. • All Velocity tools are covered by a two year warranty. • Velocity SU-matic LU3000 M tools are in stock at our facility in Huntsville, AL. Boring Bars Offset 14.910.0.0208.0 1.5 Yes Ext./Int. Full Depth 14.910.0.0247.2 2.0 - Ext./Int. Quad 14.910.0.0363.0 1.0 (4) No Ext./Int. OD-I OD-I 14.910.0.0239.0 C4 No Ext./Int. Bar Offset 14.910.0.0237.0 C4 No Ext./Int.